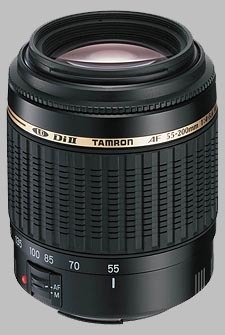 (From Tamron lens literature) This is a telephoto zoom for exclusive use on digital SLR cameras that covers the focal length range equivalent to approximately 85-310mm when converted to a 35mm format. The lens will allow owners of digital SLRs fitted with standard zoom lenses to enjoy with ease the professional-looking "pulling" and "compression" effects particular to telephoto lenses. Since the optical system is designed for exclusive use on digital cameras, the image circle is smaller, resulting in a compact package measuring 83.0mm (3.3"), accepting a 52mm standard filter and weighing a mere 295 grams (10.6 oz.). For photographers who bought their digital SLR camera in a kit with a standard zoom lens but are dissatisfied with the telephoto capability of the standard lens, it offers a desirable telephoto zoom range at an affordable price as a second lens. The new tele-zoom will allow these photographers to enjoy the telephoto capabilities that yield dynamic telephoto shots. The lens is ideal for many photographic opportunities including sporting events, scenery and portraiture. I purchased this lens 2 years ago for a trip to India for use with my 40D my sole priority being for a light lens. Was therefore rather surprised but just how good a performer this lens was despite its lowly price. The obvious trade off for the weight being its speed, but there was no way I was going to carry a Cannon 70 – 200 f2.8. It is surprisingly sharp especially if stopped down and has proved to be very reliable. All in all better than the average and at this price an absolute bargain. Nikon professional user. Bought as a lightweight lens to have in my bag when travelling. Great little lens that is as sharp as any of my lenses. Works well on the Nikon D300 and D200 bodies. I have sold my copy as it did not have an in-built AF motor for the D40 I use on holiday. I will replace it soon with the +motor copy. Two of my favourite pics were taken using this lens! Acceptable sharpness and contrast, light and small, extremely cheap. Not much at 140 US $, except for high distorsion and slow AF. I am still using it when I don't want to risk my more expensive lenses, in rain or in snow. Optically is almost OK: it is quite sharp and contrasty, its main drawback is high distorsion. Unlike optical quality, AF speed (really slow) and build quality (pure pastic) is proportional with the price. I bought this lens many months ago because I needed an economical telephoto lens to begin with. It also came with the ability to focus quite close, giving about a 1:2 at 200mm, great for experimenting with macro. So this lens is mainly for beginners who are first experimenting with telephoto, or people who need a good quality, economical telephoto which is small and lightweight. Nice thing about this lens is that no one will think you have a telephoto on your cam. It also is easy to carry around all day. Additionally, it's not even that slow for it's price, size and focal length at 4-5.6. AF is fairly accurate, though if it begins to hunt, it takes a while because of the wide focus range. A distance limiter would have been nice, but of course at this price point, good luck. Build quality is descent. Lens wobble is almost non-existent dispite it's long extention, the hood has a nice feel to it and can be used to MF since the front element rotates. Now image quality of this lens is not bad, but isn't L or DX grade either. It will probably give better overall optics than your kit wide open, but in high contrast areas, you may see a strange ghosting abrasion, which is probably due to cost cutting in glass coatings. However, these abrasions are small, and will only be seen when you zoom in on your monitor, print large, or do heavy cropping. Overall, this will give better images than most of the 70(75)-300 lenses near it's price, but the telephoto zooms that run about $500+ will definitely outperform this lens in most categories. If price, weight, and size are most important to you, this is an excellent tele zoom. If you need excellent image quality and optimal AF performance, you'll want to spend more money on something larger and better. This was my first loom lens I bought after the kit lens, and at the price it is a total bargain. Yes in low light the AF can hunt a little but give normal light it can produce some fine images. It can be very sharp with good colour and contrast. Yes the manual focus is small and fiddly , but for who this lens is aimed at I doubt that is a worry.This is a excellent partner to a 18-55 kit lens but has much better IQ . I did not know what lens I really needed when I got my Canon 30D so a cheap zoom has let me experiment at different focal lengths, before spending big money on a lens. I would recommend this hidden gem to anyone starting out in photography and wanting to try a cheap first zoom. I bought this lens in a local camera store after looking at several other lenses in this price range for my D70. Since purchasing it, it has come to grow on me more and more. The build quality is decent for its price range, the focus ring is a little small but not unusable. Its the quality of the results that has lead me to believe that this often overlooked lens is really a little gem and I'm finding I'm frequently fitting it to my camera when I'm out for the day. For its price, and as a compliment to a kit lens, this lens is more than adequate. I bought this to compliment the kitlens, like many other people. I really like it, and aslong as you nail the focus, you can get some really nice photos from it. Alot of professional reviewers try and compare it to lenses upto 10x its price, that just isn't right. If you can't afford a more expensive lens, buy this, you won't be disappointed. I purchased this lens to compliment the 18-55 kit lens that came with my D80 and it is a good lens, especially for the price. At f/4-5.6 it shows it's limitations in low light, but for outdoor general use or indoors with flash, it produces really good images. When I can afford it I will be adding the Nikon 80-200mm f/2.8D ED AF to handle low light situations. The manual focus ring is terribly tiny, but I use manual focus so rarely it doesn't really effect me. If you are looking for a light walk around zoom, I would recommend you give this Tamron a try, I think you will be very happy with your purchase.